Memories of a crumbly, yet soft, date cookie* I had on a visit to a shuk (market) on last summer's visit to Israel swept over me when I saw this date coffee cake recipe. I love indulging in a prolonged holiday brunch with jazz playing in the background. Everyone is waking up at their own pace, having coffee, a pancake or two, stretching and chances are S is crawling back under the comforter of his cozy bed. He misses his bed mostly I think when he is in college, and the food of course. Dates, edible fruits of a certain palm tree, believed to have originated around Iraq, are a popular Middle Eastern staple. Also popular in some parts of North Africa and South Asia. The ancient Egyptians as early as 4000BC cultivated dates for wine making There is evidence of date cultivation in Eastern Arabia as early as 6000BC and in Western Pakistan as early as 7000BC. Through the trade routes, dates were introduced to Asia, Africa, and Europe, and later in 1765 by the Spaniards to Mexico and California. Dates, rich in fiber, vitamin A, iron and many antioxidants are believed to curb different cancers, including but not limited to colon, prostate and breast cancers. Dates also contain 16% of recommended daily levels of potassium which helps control heart rate and blood pressure. Rich in minerals for bone health. I was really hoping to find a good shaping video for this tea ring but am not happy with the search results. If you come across one please link in the comment section. 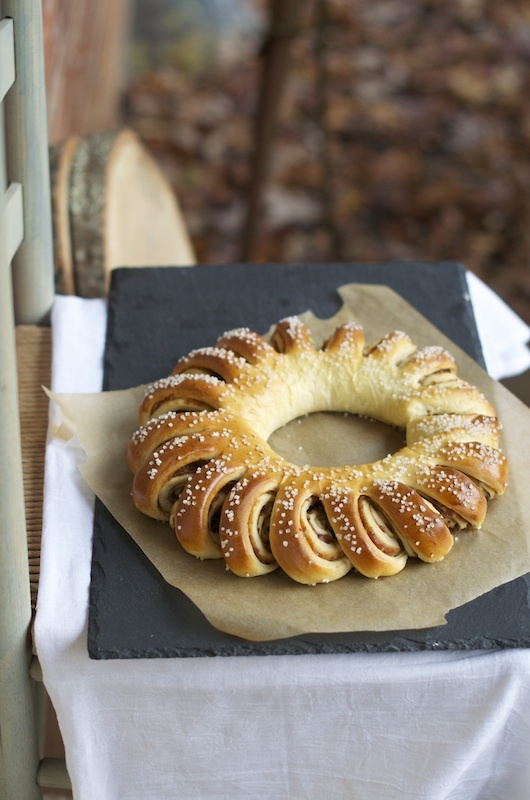 This bread is more commonly known as a Swedish Tea Ring (Vetekrans) so I couldn't resist including a clip from the Muppet's Swedish Chef. The Swedish version usually has cardamon in it. This post is a part of my professional collaboration series with Red Star Yeast (see below for a full list). In a small saucepan combine all ingredients. Bring to a boil, reduce heat and simmer for about 3 minutes, until thickened. Cool completely. If filling is too thick to spread, add some orange juice to thin it out. In a large mixer bowl combine 2 1/2 cups of flour, yeast, salt and sugar, and mix well. In a small sauce pan combine water, milk and butter on medium heat. Let it reach 120-130F, the butter does not need to completely melt. Attach dough hook to mixer, add the warm liquid to the flour and mix on slow speed. Add the two eggs and continue mixing on slow speed. Add the remaining flour gradually and knead on slow for approximately 8 minutes. Scrape flour off the sides once in a while so it will completely incorporate into the dough. 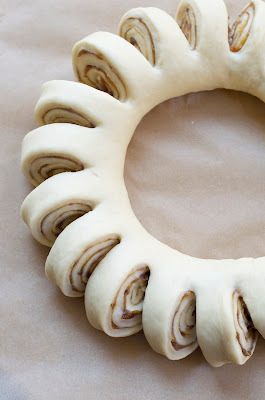 Coat the dough with a thin film of oil, set back into the mixer bowl and cover with saran wrap. Let it rise for 1 hour. Punch down the dough, divide into two equal parts. On a lightly floured surface roll out each part into 15X12 inch rectangle. Spread the filling. From the longer side start rolling tightly. Pinch the edges to seal and form a ring and pinch edges. Move to a parchment paper lined baking sheet with the seam down. With scissors, make cuts 1 inch apart, from the center top of the ring down. Turn each slice on its side. Cover with a kitchen towel and let rise for about an hour. Whisk an egg well and gently brush the top of the tea ring. Sprinkle with pearl sugar. Bake at 350F for 20-25 minutes or until golden brown. Remove from cookie sheets and cool. You can find a variety of fillings for this tea ring on Red Star Yeast's site. **Author is not a health professional, please consult your physician for medical advise. This looks amazing Shulie! Absolutely gorgeous! How gorgeous is that! Love the new banner. My faves: Figs & Pomegranate (sounds like a great name for another blog)! This is a gorgeous ring and it has dates, which I adore! I love the pics, the recipe and your new look! Great header Shulie! Gorgeous; this looks so good! It looks amazing and perfect! What a beauty. Oh Shulie.. this is gorgeous and full of amazing flavors! Your shaping of this tea ring is perfect. Now I am going to have to make this!! This is such a beautiful tea ring! Gorgeously golden! Oh, Shulie!!! You know how to turn my eye. LOVE this recipe!! I'm fairly new to dates, and I'm really enjoying them. I think I would find this irresistible! Gorgeous Shulie, just so gorgeous! We don't get mejdool dates here, and seeing so many on deliicous food blogs is making me want some now. YUM! Beautiful tea ring! Shulie - It looks soooooooooooo beautiful! I love working with yeast and would definitely try this recipe. I must say again - it really looks amazing - wonderful job!! Oh My God! That's so gorgeous! So beautifully shaped. 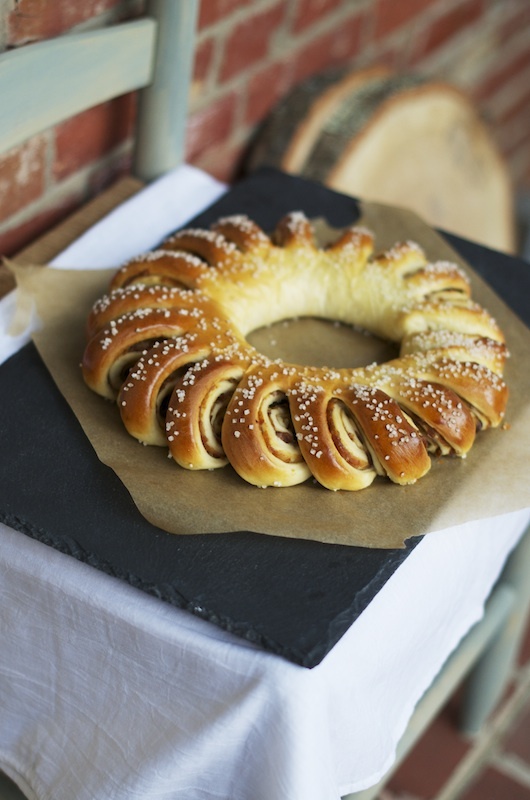 How pretty that tea ring is.. beautiful golden bake! Holy moly! That's stunning, Shulie! You sure know you're way with yeast! Absolutely brilliant! Gorgeous Shulie; I remember my grandmother making these...it's all coming back to me now! I might have to try my hand at it; I love having her with us at the holidays in spirit and we shared a love of food...so this would be perfect! This looks so neat, so pretty! My husband loves date, I have to try this. although I doubt if I shape it like you did. It's beautiful, absolutely perfect. Love the date filling and the shine it has from the outside. Awesome rings...love to eat one piece right now. Absolutely gorgeous Shulie, what an impressive pastry! This is just how I make my cream cheese tea ring! I need to expand my horizons, though...a date orange filling sounds magnificent! 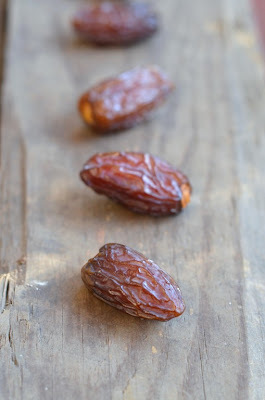 I absolutely love dates - recently baked a date and fig stollen, but now I have something new to get me to use the incredible amount of dates I brought back from Dubai. Looks simply awesome! oh my..simply gorgeous!!! what perfection & finesse..Takes my breath away!! Such a beautiful tea ring Shulie. we usually make tea rings for holiday and was planning on making one Thursday morning. This is so beautiful. 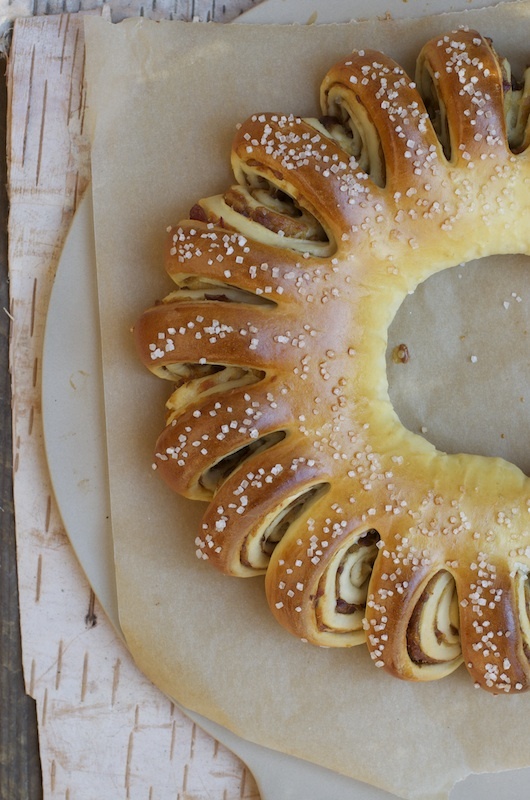 I cannot wait to make this and will be sure to add the cardamom (I love the scent and flavor). This will be the first time I cook with dates so I can't wait to taste it. What a gorgeous presentation. Orange zest and juice for this recipe? Thanks. This is just beyond gorgeous! I've never made a ring like this. I love the cuts through that expose the lovely swirls of filling inside. It's almost too pretty to eat.